Staging Diva Graduate, Patricia Ebrahimi, owner of Show-Smart!, is proving over and over again in Washington DC that home staging works. In the month of May, Patricia staged five properties that sold in record time in her “slow” real estate market. After staging two renovated historic row houses, they each sold for full price the first day after they were staged. One had been on the market for more than two months without any traffic. This successful streak continued when Patricia staged a town house owned by desperate young sellers who were thrilled to accept an offer that came in within a week of staging. “This town home needed only two chairs, a table and lots of accessories to bring out its good features and bring on the buyers,” said Patricia. Patricia was also hired to stage a very small vacant ground level condo which had been on the market for over a year with no traffic and no offers. After staging, this hard-to-sell condo sold in 6 weeks at almost full price. It’s great to read continued proof that home staging works even in a slow real estate market. If you have experienced success like this please write me so I can feature you in an article like this one. Your story is so inspiring! I just finished the training program and CANNOT WAIT to get to work. It was great fun to read of your success in a slow market. Thank you, Debra, for sharing this with us! Congratulations Patricia on a job well done!!! I love these helpful blogs! That Patricia Ebrahimi of Show-Smart! was able to help elderly sellers see that their good taste in 1987 had to be “translated” to appeal to the buyer age group of 2009 is a client management approach that I won’t forget. The larger question is, what is “dated design?” If classic, traditionally elegant interior design is too “museum-like” for today’s buyers, when do today’s mocha or split pea green walls, dark wood kitchen cabinets and stainless rod pulls begin to look pedestrian? Does a crystal chandelier have to yield to a pseudo-bronze and glass fixture? Must draw draperies over sheers become curtains and side panels? Are valences, cornice boxes and lambrequins today’s dinosaurs? When does staging cross the line and become interior design? And should it? Were Debra to write on this topic, I, for one, would certainly buy it, as should every staging professional. “Dated” is not static, and anyone can, over time, fail to see what is passe. Thanks Debra for the shout out regarding my merry month of May Home Staging successes! You make the great point, Danica, that Home Staging is NOT interior design. Stagers must stay current as to home decor trends b/c that’s what buyers identify with when looking at properties. Naturally these things change, but that just mean we get to go shopping more often!! Congrats !!!!!!!! Love to hear others success stories. We continue to prove over and over our services work. Way to go !!!!! This is awesome, Pat. Congratulations on a successful stage. In looking at the before & after pictures, I can understand completely why this sold so quickly. Great staging. The results prove that professional staging works.and Patricia Ebrhimi has the talent and knowledge to do it!. Great Work Patricia! Pat proves again that staging Sells. We stagers do need to stay current with trends and colors choices, but ultimately our job is to present the home in its best condition and highlight architectural details – not the decor. A neutral background and accessories that add some splashes of color will assure a prospective buyer that they can move in immediately and accessorize with their color choice and their work will be done. These fast sales generally mean a buyer that is ready to move quickly and with relative ease. We stage for the buyers – the sellers are moving! Pat will have many more merry months – because she is a staging sista. Knowing Pat, as a friend & colleague in the industry I am not surprised by these results. She is a top notch professional and an obvious expert in her home staging market. She proves again and again her skill, professionalism and knowledge in getting the job done. Also taking the care necessary to treat her clients with respect, Pat helps them transition from home dweller to home seller, nothing personal about it with results that work! 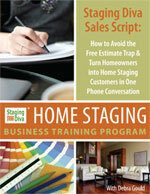 Great testimony to the power of home staging! I love that all of you are here to support each other and spread the word that STAGING WORKS! Thanks everyone! I know, Debra, that good fellowship starts at the top and filters down, and you’re the top.